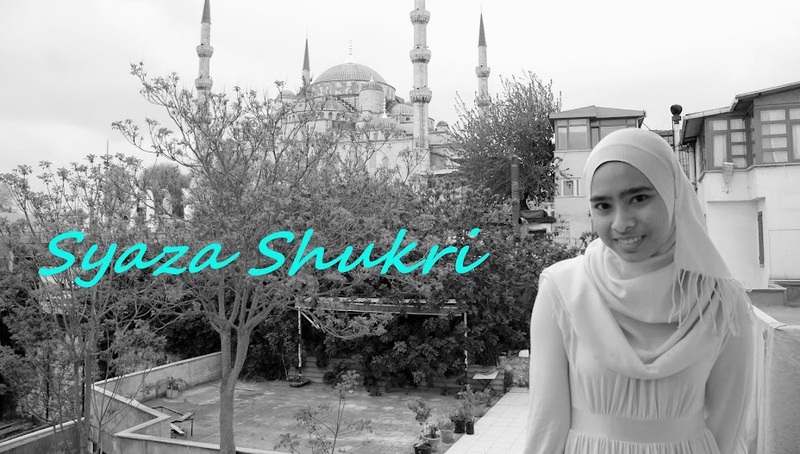 Syaza Shukri: Backstreet's Back, Alright! 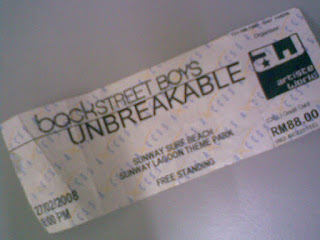 Last night I went to the Backstreet Boys (BSB) Unbreakable World Tour at Sunway Surf Beach, Sunway Lagoon Theme Park. It wasn’t my first time seeing them as I’ve seen them perform live during the FON concert in 2005. But nonetheless, as a (closet) big fan of them of course I have to see them again! Unfortunately though, I also had my Macroeconomics mid-term test yesterday so I had to rush and was only able to leave INTI with him around 6.20 pm. The road was clear all the way from toll to toll but (with his ‘help’) I took a wrong exit and then got lost for half an hour. Told you guys that getting lost is my expertise… But then thankfully we were able to make it to Pyramid around 8 pm and we rushed to the Surau for our Maghrib prayers. Since we were already late we didn’t have the chance to get anything to eat… Sorry… :( After meeting up with my cousin the three of us went looking for the place connecting Pyramid to the Hotel (thanks Lils for your help!) The line wasn’t long; I guess because we’re technically late. The show was scheduled to start at 8 but you know the trend with international artistes so I wasn’t that worried. We went to collect the tickets and made our way to the stage. Shila called me asking us to join her and Adilah and Adilah’s cousins but with that many people around it was hard. So instead, the three of us settled near the screen at the left side of the stage. Oh I love the show. How can I not? Their performance was amazing, love the choreography, love the wardrobe changes, and especially love the new arrangement to their new songs. :) They sang most of their hit songs and also most from their new album. But the crowd shook Sunway mostly when they sang their oldies such as I Want It That Way, Quit Playing Games With My Heart, Show Me The Meaning Of Being Lonely and Incomplete. For me though, I especially love it when they sang As Long As You Love Me, All I Have To Give and I’ll Never Break Your Heart back to back. Not just because those are my favorites but also because I had him with me :) But the night wasn't all sappy! They also sang The One, Larger Than Life, The Call and EVERYBOOOOODYY...YEAAAHHHH! :p Plus they did all the dance moves from their videos! It was a fun show la in conclusion :) They performed non-stop for almost two hours so got to salute them for that. After the concert I called up the babes and met them near the pool. By 'them' I meant Shila and Adilah, my usual concert partners-in-crime. Then I met Kak Sofwah (whom called me the entire time of BSB’s performance during FON.) Since Kak Yong, he and I didn’t have our dinner yet, we decided to go to NZ since it’s along the way to my house. Shila and Adilah went there too. Can't believe that even though one is studying at INTI, one in UiTM and one in KMNS we can still go to NZ together during a weeknight :p Anyway, after sending my cousin back home we made our own way back to ‘the home.’ We arrived at INTI around 1 am. It was really a nice excursion - nowhere near INTI - and doing something else rather than going to Palma. But still, would you do it all over again for me if you have to? p/s: There isn’t any picture of us at the concert because I didn’t bring my brother's camera and my stupid cell’s battery was low.